Scherbak Ship Models © 2015. All Rights Reserved. The modern cruise industry is 40+ years old, but has never offered nice and affordable models of cruise ships for general public. Cheaply made cruise ship models are sold onboard in ship’s gift shops. They look more like crude sculptures and are not considered “models” by many people, due to their inaccuracy in scale, incorrect proportions, lack of details, and low quality. Cruise companies always commissioned models of their ships. These fine large scale replicas can be seen in their offices or on the ships themselves. They are expensive and big and are definitely not for collecting or displaying in regular living space. Another group of company-commissioned models are made for promotional purposes and mostly used as gifts for special gests and VIPs. They are often nice (especially made back in 1990’s), but inconsistent in scale, architectural correctness and quality, also never available to general public. 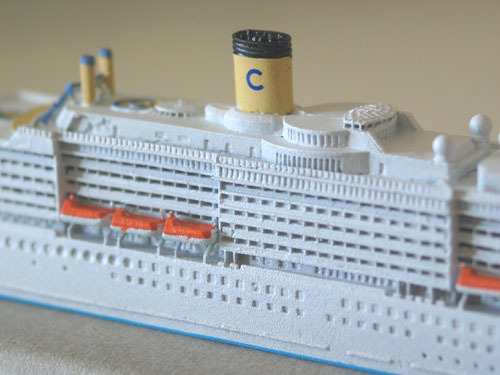 Little waterline models of some cruise ships in scale 1:1250 are made mostly by German makers. They are pretty but considered as too small by many people. Lower priced models of this group ($90-160) are often painted just in main colors (decks left white). Better detailed and finished models in this scale made by Carat and Classic Ship Collection dictate higher prices ($270-480), especially full hull versions. Release by Dragon Models of their waterline Carnival Spirit and Carnival Pride in scale 1:1250 was most innovative and promising. Models look nice and affordable ($45). But the company, for 2 years, came up only with these two sister ships…. Also incorrect positioning of the hull windows and other mistakes are lowering the value of these models..
A series of larger (12-16’) souvenir models was made in the mid 1980’s by Montego Products Ltd, Canada. Main cruise ships of that time were represented, but production for some reason was short. These models are characterized by lock of architectural correctness and details. All examples of cruise ship models mentioned above are known to collectors with special interest in this field, but mostly remain shadowed to the general cruising public, which reached the tremendous amount of more than 10 million, traveling with major cruise lines in 2006. Scherbak Ship Models is proud to offer 3 series of really fine and affordable models of modern cruise ships to the general public. Our Display Series 1:900 scale models are correct in architectural proportions and details. They are made in nice presentation style and perfectly sized for many applications. Models are expertly designed to exact architecture and details. Factory made of heavy and strong cold cast resin, hand-assembled, hand-painted. They have crisp finish and beautiful paint job, including tinted windows, exact laser-cut stickers, delicate decals etc. All together creates very realistic looking cruise ship miniature. They come in high grade acrylic display case with wooden base. The uniform scale of 1:900 allows collection of the whole fleet in regular living space as well as the display of models individually in offices and homes. Our models are greatly attractive and highly visible in small-mid. size rooms - not too big and not too small. They are powerful advertising pieces and lovely memos of your cruises. They are very reasonably priced, considering their size, complexity, labor and material costs, intellectual and aesthetic value. We also developed two series of smaller waterline cruise ship models in scale 1:1250, for cruise fans, who can’t afford larger 1:900 models or do not have display space for them. Collector's Series models are very well detailed, fully finished and encased. They come in distinctive acrylic display cases. Models are attached to the base by two screws and can be easily separated. Souvenir Series models are simplified versions of more detailed Collector's models but made to the same high quality standard and affordable for every cruise lover. 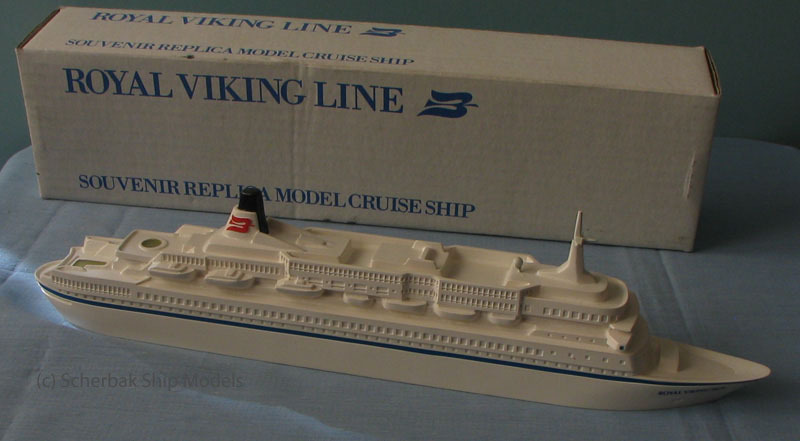 Visit our Cruise Ship Models section right now and start your own collection.